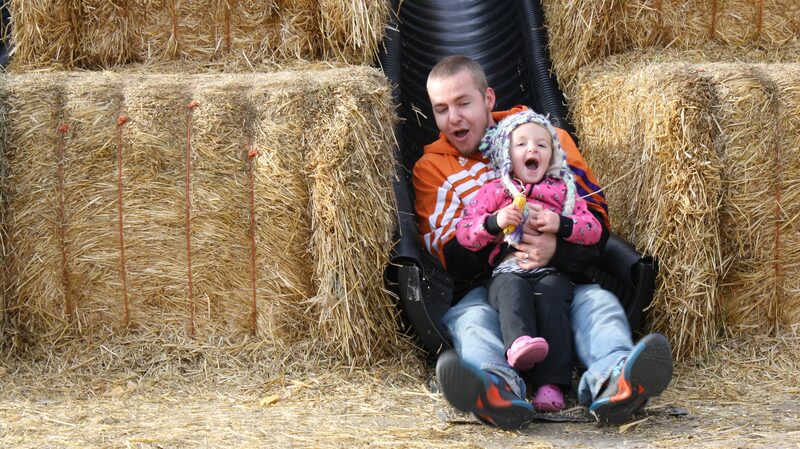 Berry Acres Pumpkin Patch is Fun for the Whole Family! - Word on the street with Visit Minot!Word on the street with Visit Minot! Berry Acres Pumpkin Patch is Fun for the Whole Family! Mother Nature was playing games earlier this week when she blew in frigid temperatures and let the snow fall onto the Magic City. With the warmly projected weather forecast for the weekend, we think it’s a great chance to get out and play at Berry Acers Pumpkin Patch! 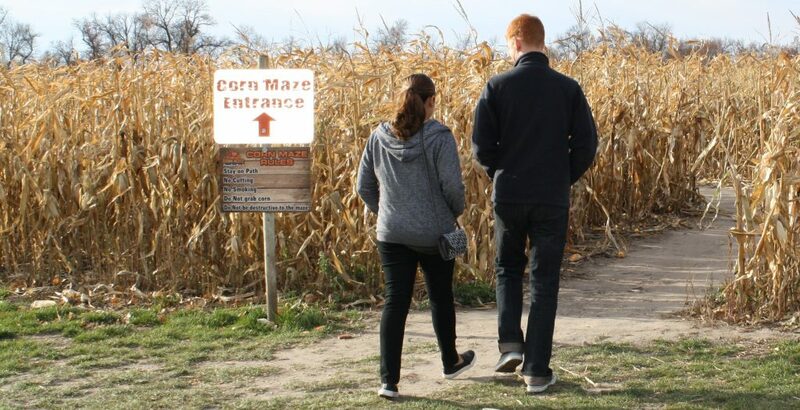 Berry Acers features two corn mazes, one large 8-acre maze, and one mini maze. There is a giant life-size checkerboard to play on and a three-home pumpkin village with homes built from many types of pumpkins! A giant spider web to climb through, a corn box to play in and pedal carts will keep little ones entertained for hours! There are many sites to see and photo opportunities throughout the area as well. 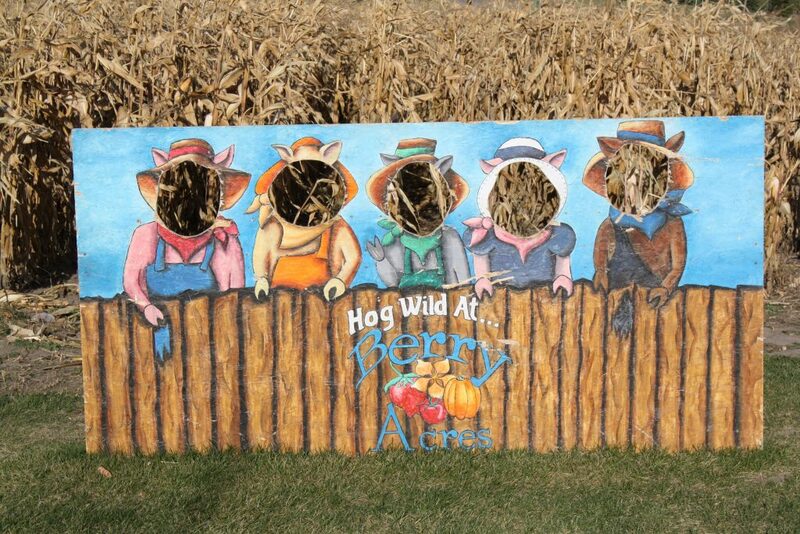 Berry Acers has giant painted hay bales displays which are painted by the staff. This year features the Teenage Mutant Ninja Turtles, a gumball machine and an enormous spider with creepy crawly tube-legs. 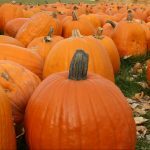 During the week, people can pick pumpkins, and check out their variety of gourds, and squashes which are available for purchase. In addition, to the products that can be found outside, there is a retail shop with jams, Halloween themed merchandise and décor inside as well. During the weekend, people are invited to entertain themselves with some extra activities. These activities are cash only and range from train rides to mini golf. The train ride for children is $1.00 a ride and the hayride is $2.00. There is also a paintball wagon. What is a paintball wagon you ask? Well, the Paintball wagon is a cart with paintball guns mounted to the sides of it. For $7.00 a person, riders can shoot 100 paintballs at 20 different targets as they ride on the wagon. How much fun does that sound?! New this year is the Mini Golf Course. It costs $5.00 to golf and is open daily. There are 9-holes and clubs for both adults and children. Everyone can enjoy some friendly competition when you grab a score sheet and a pencil. This weekend (October 15-16, 2016) will be the last weekend for the Petting Zoo. Individuals can socialize with animals such as goats, llamas, ducks, chickens, and pigs to name a few. The Petting Zoo costs $2.00 a person and runs from 12 Noon – 6 p.m. Admission is $6.00 per person and children 3 and under are free. For a group of 10 or more, the cost is $5.00 per person. Don’t miss out of a great week of weather and a great time at Berry Acres Pumpkin Patch. Berry Acres is located at 4605 County Rd 15 West and is open until Halloween (October 31).